Linking this with The Tuesday Platform at Poets United, and Quadrille #13 at d’Verse. Oh, those last two stanzas got me. Choked me up, really. Yeah. They left a bit of heavy emotion on me too, De. Thank you. We are so often lulled and comforted by those clear walls… Like the famous gilded cage almost. Many times it seems that way. We just have to break the jar and escape. We are only captive if we choose to be. Good thoughts in this. Why do I have to check the box to post comment? We are only captive if we choose to be. Very wise thought 🙂 I like that. I hope that that’s the case too. Without that checkbox, I’m overthrown by spam, sadly. My apologies, Kanzensakura. Beautiful work. We forget our invisible walls are there much of the time. Yes. We forget. Sad that there should be walls imposed, but that’s the reality most of the time. Thanks, Freya. Oh, I love that they think they’re stars in a jar. Lovely! Oh. All are stars. Some choose to twinkle happily within it. Some choose to try and break of it. Thanks, Misky. Those last two stanzas, damn Leo. I just wanted to take that jar, unscrew the lid and then smash it. Yeah. But no one really knows where the glass is to hold it. Not till one tries to break free of it. Thanks, Raivenne. It seems that way more often than not, Walter. But then we aren’t restricted till we test some unsaid boundaries. Love the ending, the twist to the “sense of freedom” in a jar! Thanks of joining us Leo! We only know that we’re captive when we try to make our escape…very clever, Vinay. Yes actually! Not an escape. If we don’t know we’re captive, it’s just a journey born from curiosity. Thank you, Gayle. I love the rhyming flow in this piece. Great picture. I love the idea of stars in a jar. Glass walls doesn’t make it less a prison. Thank you, Sara. Very true. It’s a prison either way, if you look at it from a deeper perspective. and we go on about life as it is, until someone reminds us…………. Yes. We do do that, Vandana. The moment we forget that the walls of a cage, regardless of how pretty they might be, always make a prison… that’s the moment we lose our freedom and ourselves. Those last two stanza say it so well. Yes. In some cases, they are transparent, so we want the freedom to go past them and find the world! But we lose patience when we are restricted by the glass wall rules! Thank you, Magaly. Those last four lines seal the deal. Thank you very much, Kerry. I’m with De on this one! In one way or another, we need to find a way to get through these unseen walls. Yes. It is needed. At times, and at places, that well seems vulnerable. But more often than not, they hold their own. makes it difficult. 🙁 Thank you, Maria. I am glad that the lightest of touches on the ending verse made its mark. Thank you, Laura. Oh yes, it seems at times we are bound with invisible chains which hold us back and prevent us from accomplishing our dreams and goals. We must at length strive and break free 🙂 Beautifully penned. Exactly. That’s the point, Sanaa. Those chains that are there shouldn’t matter, but they do. 🙁 Sigh. Thank you. Hopefully, one day, that breaking free will happen. The last few lines struck like a blow. Glad that you liked the verse and the last few lines. Thanks, Subha. Oh how I wish we were stars! Love the images you give, even when the last is heartbreaking..thanks for sharing. Glad you liked the images and the last one too. Thanks, Stacie. This is beautiful. We build so many personal walls ourselves with self doubt, self consciousness and fear. Add to this the walls of society that prevent us from breaking from the norm, the trends and expectations. We could learn a thing or two from those butterflies. the society has too many rules, actually. Very sad to see some of it add to the walls of our own doubts. Thanks, Mish. Whoa, powerful contrast, “allowed to think we were stars; in reality, butterflies in a jar.” This really hits home, Leo. That was the intent. Thank you, Sherry Blue Sky. Whoa, such a powerful contrast, “allowed to think we were stars; in reality butterflies in a jar.” That really hits home, Leo. It was a sad note, so it struck right, Gillena. Thanks. I enjoyed this from start to finish such a lovely flow of words. 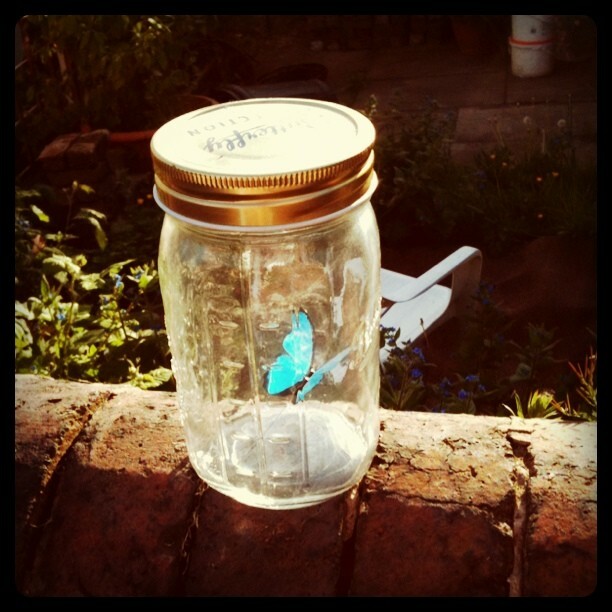 The image of the butterflies in the jar at the end really touched me in that place inside. Butterflies are meant to be free to fly. Yes. As are we, but we’re restricted by so many rules that are imposed at the crucial moment. Thank you very much, Truedessa. Oh my, those last lines got me. Such a beautiful piece. Some days I feel pinned to a cork board. Today felt like such a day, Cosmo. That’s a different perspective to what I had when writing the poem. 🙂 Goes to show how a few words can mean something totally different to one person. Those last lines hit like a ton of bricks. So light, so lovely…and then, thunk. Well done, and a bit jarring. Yes. That was the intention, Sue. Thank you. It’s not about permission, perhaps. 🙂 When we’re not told of restrictions till the last moment, we feel we are stars. Then just as we’re about to shine, the rules are brought in. Sadly. Quadrille is just 44 word poetry. 🙂 Do try, Marian. It’s fun! Yes. 🙂 It’s good to open the lid. But society doesn’t allow always. Thanks, Pixie. Oh. That’s such a sad reality for so many of us. Our dreams come to an abrupt end when the sunlight in the form of harsh reality blinds us.